A zoom lens, also referred to as the parfocal lens, allows the camera to vary the range of the shot from a long shot to a close-up and vice-versa by altering the focal length. They are used with cameras (for still photography, video and motion picture cameras), binoculars telescopes and various other devices. Short Zoom lens – They are best suited for wide and super wide range and offer a maximum range of 50-60mm. Though these lenses are usually 35-70mm f/3.4-4.5 and 28-70mm f/3.5-4.5 lenses, some brands of cameras also have 18-55mm f/3.5-4.5 lens. Super Zoom lens – These lenses are used for covering huge ranges and wide-angles. They usually cover 18-200mm. Versatility – These lenses give the photographer the opportunity to adjust the focal length of the camera and make a distant object appear close. This is especially helpful for wildlife photography, shooting portraits and the like. Speed – The speed of these lenses have contributed to an increase in their demand. Fast zoom lens enables the photographer to capture an image even in darkness by using a fast shutter speed. A fast lens is usually preferred by professionals, though slow zoom lenses have also become popular in the recent years. Sharpness – Zoom lenses were often not favored by professional photographers as they produced blurred images. As a result of advancement in technology, zoom lenses ensure the clarity and sharpness of the images that are taken using a zoom lens. Light in weight – The modern zoom lenses are very light in weight and smaller in size. They not only take up lesser space in the bag but are also easier to be carried without being a burden. Easy to focus – The various unique facilities that modern zoom lenses offer, like auto-focusing, makes it easier to focus on the subject of the image and shoot a sharp image, even when the subject is moving. Enhance creativity – They give the photographer the opportunity to adjust and innovate with the composition of images. There are various brands that manufacture zoom lenses. Research on the internet about the zoom lens that meets your expectations and purchase a Camera Zoom Lens accordingly. Alicia Hodkins is a renowned author. She is a travel freak and is passionate about photography. In this article, she has focused on some of the benefit of camera zoom lenses. Panasonic been launched its Lumix FZ40 for a while now and it is a new hybrid digital camera that further bridges the gap between a compact camera and a DSLR. Packing tons of useful features like a Leica 25-600mm Optical Zoom Lens, HD movie recording on AVCHD Lite format, Noise-suppressing Dolby Digital Stereo Creator microphones etc, the new Lumix FZ40 will put a smile on your viewers’ faces every time, without putting a huge dent in your wallet. A new Jog Dial lets you quickly jog between settings according to shooting conditions for both movie and stills. It is also great in giving your thumb a good workout. Powerful Leica 24X Optical Zoom Lens with 25mm ultra wide angle expands your creativity while getting you closer to the action at 600mm. Intelligent LCd features a 3.0-inch, 230,000 dot resolution, and a wide-viewing angle that lets you frame your shot in a variety of ways for both shooting and viewing, 11 steps of auto adjustment gives you the most comfortable viewing experience under all lighting conditions. Venus Engine HD II uses two CPUs to mash all that data intelligently and fast, so you never need to wait to take your next masterpiece. High-speed Burst Mode (Photo) takes 10 frames/second at 3 Megapixels. Great for sports, or for that precious first few steps of your baby which will print comfortably up to 8R size. See incredible detail with the ultra sharp HD video recording on AVCHD Lite format that also doubles your recording time which is just perfect. The new Lumix FZ100 is currently the head honcho in Panasonic’s stable of hybrid digital cameras, featuring a mind-boggling 24x Leica 25-600mm Optical Zoomlens with Power O.I.S coupled to a newly developed 14.1 Megapixel MOS Sensor that shoots a class-leading 11 frames per second in full resolution. Handling all that speed in the Lumix FZ100 is the new Venus Engine FHD that dishes out Full HD movie capture in AVCHD format and 11 fps stills with intelligence and panache. Sonic Speed AF makes sure that most of those 11 still frames are in focus. 11, 60 and 220 frames per second! 11 fps full resolution stills, 60 fps 3.5 Megapixel stills and 220 frames per second video (QVGA). Burn through your memory cards in a flash with the new Lumix FZ100. A Burst Mode button on the camera makes it all too easy. You can as well playback the entire burst sequence like a slideshow. Power O.I.S (Optical Image Stabilization) nearly doubles the power of the original Mega O.I.S, allowing you to shoot at ultra low speeds of up to 0.5 seconds handheld. Tripods are soon becoming a thing of the past, thanks to Panasonic new innovation. Newly developed 14.1 Megapixel MOS Sensor makes capturing Full HD movies in AVCHD format a breeze. Its advanced micro light tube structure means higher sensitivity; photos and video are reproduced in superb detail and clarity, making it all the more worth your effort to go out and shoot to your heart’s content. Venus Engine FHD featuring Intelligent Resolution Technology optimizes your stills and videos by applying selective noise reduction and sharpening, ensuring, higher quality reproduction over a wider range of lighting conditions. It’s also energy saving, allowing you to shoot approximately of 410 shots on a single charge. The Leica 25-600mm lens has 14 elements in 10 groups, with 3 Extra Low Dispersion lenses. Pleasing bokeh for portraits, high clarity and superb colors are in the cards. Nikon is releasing the Nikon D50 camera which can be said is the lightest, smallest, and easiest-to-use DSLR camera at this time. It is designed for the wide variety of shoppers who are attempting to reap the advantages of the image quality, velocity and responsiveness Nikon DSLR provide. The affordable priced of Nikon D50 makes it possible for everyone to purchase. You would want to read this in case you haven’t ever used a DSLR type of camera before, or else you want a refresher course on the basic aspects of how your new camera works. Most modern DSLRs which is including the Nikon D50 that use a conventional mirror and prism system to move light to the places it needs to be for image preview. Light comes in through the lens and hits a large mirror that reflects most of the light up into a prism, which in turn reflects that light (and reorients it so that it’s right side up) into your eye via the viewfinder eyepiece. When you press the shutter release, the mirror flips up out of the way, a shutter opens to reveal the sensor, and the light then goes directly to the digital sensor. The D50 steals the best features from previous Nikon digital bodies, builds on the interface Nikon used in the D70 and D100, and adds a few wrinkles of its own. From the D1 and D70 series, the Nikon D50 inherits an electronic/mechanical shutter trick that provides fast flash sync speeds. Essentially, shutter speeds up to 1/90 are done mechanically, while shutter speeds above that are done electronically. If this all sounds like it might be a technological powerhouse in a small package, you are right, it is. And you will note that Nikon is pretty good about standardizing on technology across their lineup. While the Nikon D50 is not as capable as a D2x, it is a lot closer in ability and function than most people at first guess. The Nikon D50 uses the same mount for interchangeable lenses that Nikon has used since the first F-series camera, introduced in 1959. While Nikon has made many subtle improvements to the mount to support electronic exposure calculations, autofocus, and vibration reduction, the physical attributes have remained largely unchanged. This allows Nikon D50 owners to use virtually any manual focus or autofocus lens Nikon has made. That said, the Nikon D50 most closely is kind of alike to the D70 series, both in design and features. In many ways, the Nikon D50 is simply a slightly downsized and simplified D70s. Like most Nikon bodies, the Nikon D50 has a very sturdy body that is partially sealed to protect against the elements. You should be able to use the Nikon D50 in light rain or mist without having to provide much extra protection. The lithium-based batteries of the Nikon D50 don’t lose capacity over shot periods of non-use. If you store the battery for a long period of time, it will probably lose some charge, though. It takes very long periods of time to see significant power reduction on a battery not being used. Overall, the battery performance of the Nikon D50 series is actually quite good. By minimizing use of a few power-hungry features, you can easily get by on one or two batteries in a day full of shooting. In case you wear glasses or contact lenses, you need to ensure that your optometrist know that you are a photographer, and that viewfinder image is formed at a distance of 1 meter with an eyepoint relief of 18mm. You optometrist may make slight adjustments to your prescription which assist you see the image in the viewfinder more clearly. Exposure bracketing can be performed by this Nikon D50, providing you with an automatic series of three pictures taken at different exposures. These exposures can vary exposure, or by white balance, but not both simultaneously. This setting allows you to set the bracketing feature to function and to choose how the camera performs this braketing. One more advantage of the Nikon D50 is its ability to capture with a DSLR quality images and also the inventive prospects offered by interchangeable lenses. With the launched of the Nikon D50, Nikon has as well introduced two new and affordable DX Nikkor lenses: the AF-S DX Zoom-Nikkor 18-55mm and AF-S DX Zoom-Nikkor 55-200mm. These two lenses are perfectly paired with the Nikon D50 to provide a wide zoom range, at the same time maintaining a lightweight and extremely-compact size. This Nikon D50 is compatible with more than 50 of AF Nikkor lenses, providing the identical excellent shade copy, picture readability and quick autofocus efficiency relied upon by the different number of skilled photographers. Getting yourself a Canon EOS 7D and you can immediately tell that you are holding a quality camera in your hands. All of the controls have a reassuringly sturdy yet precise feel to them, and under the covers, the Canon boasts higher resolution and greater image processing power than any of the competition. Our only real reservation is that to get the most out of the Canon EOS 7D camera, you need to fit it with an expensive Canon L-series lens or an upmarket third party equivalent, because Canon’s more modestly priced lenses – even the new EF-S 70-300mm f/4-5.6 IS USM (reviewed in last issue’s group test) – do not really cut the mustard for sports or action photography. Canon EOS 7D was the first DSLR to break ground with Canon’s new iFCL metering system, subsequently featured on the 550D and 60D, which intelligently takes focus, color and luminance information into account when setting exposures. It works well for sports shooting, because the metering is heavily biased to the active focus point, which is generally the area of interest, but still lacks the unerring consistency of Nikon D300s. The Canon EOS 7D’s Pentaprism viewfinder is a delight, offering full 1x magnification and 100 percent frame coverage. Launches Canon’s Quick Control system, enabling access and changes to multiple shooting parameters. The joystick-like control makes for easy menu navigation, switching between AF points and other options. Use this for adjusting white balance, drive mode and exposure compensation, as well as menus. When it comes to focus points themselves, the Canon 7D leaves the 550D and 60D dead in the water, featuring no less than 19 AF points, as opposed to the other cameras’ nine. This is excellent news if you are shooting erratically moving targets because, in AI Servo autofocus mode, the center AF point is used to initially lock onto the target and all other 18 points are used as necessary to keep on tracking if the target strays from the center of the frame. The Canon EOS 7D also rules the resolution roost, having, at 18 Megapixels, significantly more MP under its bonnet than most of the competition. In spite of this, image noise is reasonbaly well contained at high ISO settings, at least within the standard range, which goes up to ISO 6400. With a 1/8000 second maximum shutter speed and class-leading 8fps continuous shooting rate, the 18 MP resolution provides the camera a fantastic image processing to do, but the burden is eased by the inclusion of two DIGIC IV image processing chips. Even so, shooting rates can slow down after a few shots in highest resolution RAW mode, but at least medium (10MP) and small (4.5MP) RAW modes are as well available. Controls are not the most intuitive, but once you are up to speed, the Canon EOS 7D is a real fast shooter. The Sony Alpha A200 is the 2nd generation of the company’s first digital SLR, the 1st generation is the Sony A100. In case you are on you way searching for a DSLR camera that can shoot for high quality photo with lightweight and easy to use, then this Sony Alpha A200 will be your ideal option. When come to review on Sony cameras, most of the reviews will use A100 and A200 to be the comparison of their major features. One of the features that relished by most of the Sony camera users is that this Sony Alpha A200 model is come with a 30% faster, sharper auto-focus compare to the 1st generation Sony A100. Therefore, by using the A200 model you are able to take for more photos with less wait due to the camera has already standby by itself when you want to take photos. So, if you been experience many times that you keep loosing some extraordinary and memorable scene due to slow response of your previous cameras, you are not have such thing happen to you again at the time you are using this Sony Alpha 200 to shoot for amazing and memorable scene. Sony Alpha also featured with LCD menu that is of specially designed. Rather for you to have to keep in mind exactly what this switch control or that knob does, a simple and easy on-screen menu enables anyone to get total control on the DSLR camera. Doesn’t matter whether you’re an expert or totally new to using DSLR camera, as long as you get a camera that has this feature you can start taking photo immediately. You can even find a battery indicator light which provides you information of you still got how much power remaining that you can take picture with the camera. With the feature you do not need to guess when your camera is going running out of battery and therefore can avoid any hassle that could happen when you want to take picture at the crucial moment. You are going to find many more reasons for you to buy this Sony Alpha A200. The camera is make with sleek design to the handy pop-up flash. You can even find the routines built in to assist the camera compensate for a shaky hand so that you are able to take for much sharper pictures. With the camera with 10.2 MP the clarity can be guaranteed, since this DSLR camera is willing to capture even the most minute details. Most users would rate this camera for 4.5 stars with a full of 5 stars. The camera is close to perfect but is not really having 5 stars is due to the fact that this DSLR camera can be more often than not getting more advanced than the user. Therefore, even this could be a trait in which most users can get outgrow faster, but in another way this Sony Alpha A200 could still be rather frustrating if it is your first time using a DSLR camera. Canon PowerShot SX30IS or Canon PowerShot SX3015? When come to Canon PowerShot SX30IS, Most people will think that it is actually spell as PowerShot SX3015 model. And many are trying to search this SX3015 model online but end up unable to find any information about such camera since this model is not exist at all on the market. Therefore, if you are looking for this model, you should type in SX30IS instead of SX3015. This Canon PowerShot SX30IS would be an awesome product that can offer you sufficient features for you to take full advantage of your photo shooting potential when come to creativity. The Canon PowerShot SX30IS digital camera has a a 14.1 CCD sensor, a 24mm wide angled lens, 4X digital zoom, 35X optical zoom, and incredible enhancement compare to it predeccessor Canon PowerShot SX20IS. The SX30IS unifies tremendous optics together with substantial technologies to ensure that photography enthusiasts are given access to an excellent camera for imaginative endeavors of all kinds. In addition, this multi functional camera has probably the most remarkable selling price as well. The Canon PowerShot SX30IS is allowing you to shoot photos with different resolutions and you are able to set the resolution range up to 4320p x 2340p. This SX30IS camera features with an image stabilization, five level of brightness adjusting mechanism, a zoom framing assist, smart auto features, an HDMI output, as well as the addition system connected to this camera is undoubtedly extensive. This Canon PowerShot SX30IS digital camera is able to shoot for video with the speed of 30 fps (frames per second). Besides, the camera also features with a manual focus, miniature effect, a focus bracket AutoFocus assist lamp, continuous shooting options, and an ISO sensitivity range which has the maximum limit up to ISO 1600. The SX30IS camera as well come with several different scene modes that you can choose to shoot on different occasion such as landscape, sports, portrait, SCN and etc. This Canon PowerShot SX30IS digital camera model can be the ideal mixture of both the extremes of which this is especially the key reason why this particular device has seized the worldwide market currently. An additional emphasize with this camera product would be the sound quality of this camera. Typically, most of us are trying not to shoot for any video when we are out for taking pictures with our digital camera. The reason why no video shooting is because of most digital cameras are carrying with poor sound quality. But, if you happen to carry with this Canon PowerShot SX30IS, you will find that the sound quality is really great and this camera for sure will create a revolution for the sound quality in future digital camera. The Canon Powershot SX30IS is of lightweight camera since it only weighs at 601g and is very portable. Those days are gone in which a camera user is required to carry a cumbersome gadget in order to obtain the ideal stills: this camera is enable you to take around without adding any burden to you and is very useful while you are traveling. After all, this Canon PowerShot SX30IS digital camera could be an appealing camera and is definitely a prudent buy cautious users. The Sony Alpha A900 may need to position as one of the most awaited DSLRs on the market recently. The Sony company initially revealed a first edition of the company’s forthcoming leading design and style at some of the important shows, and then no long after the shows Sony displayed other information regarding the stabilization mechanism and image sensor it is going to implement. Finally, with the released of Sony Alpha A900 that come with a full 35mm frame-sized image sensor, Sony has just make itself hop on to the rather exclusive bandwagon. In case you don’t know, until today there are only four camera companies that provided you with full-frame DSLR cameras. While among these four companies, Kodak and Contax have since quit the DSLR market completely due to high cost and lack of innovation. Just identical to all other Alpha DSLRs, this Sony Alpha A900 also come with a built-in image stabilization that could physically adjusts the sensing unit to balanced out camera wobbling. Compare to some earlier models, this camera is still working the same way as you are not going to see the stabilizing effect from the viewfinder. However, the significant advantage is that it is able to cope with any lens you hook up with, doesn’t matter whether it is a prime lens, zoom lens, wide angle lens, or telephoto lens. What can be the most impressive of the Sony Alpha A900 camera would be its SteadyShot system that is switching a substantially greater sensor compare to earlier version of Alpha DSLR cameras. Actually, this can be the first full-frame DSLR camera that has sensor-shift anti-shake but Sony nevertheless been able to squeeze the mechanism right into a comparatively compressed body. Therefore, If you wish to get the most pixels with a DSLR camera, the Sony Alpha A900 will be the ideal camera for you to have. Even though the size can be quite bulky, but it is going to cost you less compare to the more expensive Canon 1Ds Mark III. You are able to experienced good shooting by using the 24-70mm f/2.8 Carl Zeiss lens and because of this, many users are highly recommend this camera for photographers. My friend currently have tried to attached a 18-70mm kit lens onto the A900, and the camera seems to be quite a bit more tolerable, even though I could simply consider that high-resolution sensor would likely expose all the defects in that less-expensive camera lens. 1. For the Sony Alpha A900 camera, the AutoFocus is not as good as the Nikon brand when a comparison is make with the Nikon D3 and D700. When taking photos, the AF on A900 need more time to capture the subjects. 2. For the dynamic range, details and sharpness, and the color results from the A900 camera can be quite satisfying. 3. It is a good combination for Sony A900 camera with Zeiss 24-70mm lens and 135/1.8 lens with the camera body and its battery. 4. The LCD screen of the Sony Alpha A900 camera is too bright and so you need to set it to -2 to make it dimmer. If the setting is at 0 it is going to display the captured image with over exposure at around 0.3 – 0.5 stop. 5. For this A900 camera, the anti-dust feature is very good, it can be even better than the Nikon D700. 6. The poor thing in this Sony Alpha A900 would be the flash. Alpha flash technology is rather fall behind of its competitors. The quality of the flash is of sub-standard when compare with the Nikon flash. For most feedbacks from the users, this Sony Alpha A900 camera could still be an excellent choice compared with other models since there is not much drawbacks this camera has. It’s half a decade since Canon broke new ground with the original EOS 5D, a full-frame camera in a relatively compact, lightweight body. There is no exceptional with the Canon EOS 5D Mark II. At the time, it was great news for those switching from film to digital, as it was compatible with Canon EF and independently manufactured full-frame lenses, making the most of wide-angle extremities. For digital photographers, the switch from APS-C to a full-frame 5D can be more painful because, unlike with rival Nikon and Sony bodies, the 5D has no ‘crop’mode and is incompatible with any Canon EF-S lenses that you might already have. The same is true for the newer 5D Mark II, although the current body includes a veritable armada of major updates. Headline features kick off with a 21.1MP CMOS sensor that’s virtually the same as the one used in that stalwart of professional photography, the second-mortgage-inducing Canon EOS-1Ds Mark III ($8,000). However, while the 1Ds Mark III’s sensor drives two DIGIC III processors, the 5D Mark II features the newer DIGIC IV chip, along with a much more generous ISO range of 100-6400 (25600 expanded), compared with the meager ISO 100-1600 (3200 expanded) range of its bigger brother. Around the back, the three-inch LCD is almost infinitely better than that of the 1Ds Mark III, with a much higher resolution of 920,000 pixels as opposed to a paltry 230,000 pixels. The 5D Mark II’s LCD screen also has exceptional picture quality, with much more accurate brightness and contrast in its default setting than the LCDs on either of the Nikon or Sony bodies on test. Another neat trick is that the brightness of the Canon’s LCD can adjust itself automatically to suit ambient lighting conditions. Naturally, the Canon EOS 5D Mark II is a stills camera first and foremost, but it remains the only full-frame D-SLR in its price bracket to feature full HD video shooting, whereas the Nikon and Sony have no video capture facilities whatsoever. Live View modes are also plentiful, with no less than three autofocus settings, including a face recognition option. For more regular shooting, the viewfinder doesn’t quite give the same 100% coverage as the mammoth 1Ds Mark III, but it’s pretty close behind with 98%, matching the Sony a850 and slightly bettering the 95% coverage of the Nikon D700. In the hand, the 5D Mark II’s chunky and solid magnesium alloy body is a real step up from lightweight Canons like the 450D and 550D, with a layout that’s very similar to the 50D. It’s easy to find your way around, with a plethora of dedicated buttons, plus a joystick-like eight-axis Multicontroller for adjusting various parameters such as setting the AF point or for accessing and navigating the intuitive Quick Control screen. After setting the main on/off switch to its secret third position, you can use the additional Quick Control dial, positioned just below the multi-controller, for quick and easy exposure compensation settings. The dial is also handy for making full use of the dual-operation buttons on the top panel, situated just in front of the top plate LCD. These work in conjunction with both the multi-controller and the main dial, doubling up button operations for metering mode/white balance, autofocus mode/drive mode and ISO/flash exposure compensation. Overall, the layout successfully treads the fine line of making as many shooting parameters as immediately available as possible, without being over-cluttered. Like other Canon D-SLRs, the menu is quite straightforward, but this comes at the expense of many of the finer points being consigned to arcane ‘custom function’ settings. For example, four levels of auto lighting optimization (none of which work as effectively as Nikon’s Active D-Lighting) and four levels of high ISO noise reduction are hidden away in one of four Custom Function menus. At least you can assign some of your most-used functions to the customizable Menu screen, and there are also three sets of Custom Shooting Modes, accessible direct from the Mode dial. 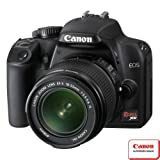 This Canon Rebel XS or Canon 1000D model is tend to be overlooked by most people due to most of the people are relish with higher price range XSI cameras. However, in case you take a serious look and doing a side-by-side comparison you are going to discover that there is actually not much has been scaled back for this XS. Therefore, you can just save some extra money for better lens glass. This Canon Rebel XS is able to perform at High ISO. You can take for your favorite scene and object even in low light condition and you can make decision as there is one thing for everyone to take into consideration and think carefully when looking at DSLRs: it is the quality of the picture when shooting at high ISO speeds. Making use of higher ISO speeds can be incredibly important when attempting to shoot for super clear images in low light conditions with the absent of a flash. The bottomline is, Canon is able to outranked its rivals in the entry level camera market. You can try to take for a couple of photos at ISO 1600 and you will find the photos can be quite solid, especially when you turn on the in-camera noise reduction. There are additional variations including the higher resolution as well as other things which actually did not take into account. In case you are thinking of either buying XS or XSi, you might think of whether your concern is on the price or quality. If price is the major concern, then you should go for XS, else of course you should get the XSi. And if you are upgrading from point and shoot digital camera to DSLR but only wish to get a entry level DSLR camera, then the Canon Rebel XS is going to meet your requirements perfectly. Ideal for a wide range of photographers from first-time digital SLR users to veteran photo enthusiasts, the new Canon EOS Rebel XS camera is designed to embody what you have come to expect from the EOS Rebel series — a fast, non-intimidating, lightweight, easy-to-use camera that produces excellent images and starts emerging photographers off on the right foot. The Rebel XS features a 10 mega-pixel CMOS image sensor which can produce poster sized prints. It also features a 2.5 LCD with live view. This camera features the DIGIC III image processor which gives you fast and accurate image processing. You can use SD/SDHC memory cards with the Rebel XS. The camera features it’s own integrated EOS cleaning system and Canon’s self cleaning sensor unit. The Rebel XSi features a 12.2 mega-pixel CMOS sensor that can produce poster sized images. It features a 3-inch LCD display with live view function. This Rebel dSLR from Canon features Canon’s DIGIC III image processor which you can benefit from it’s fast and accurate image processing and improved auto-focus and framing rate. To keep itself clean the XSi features a EOS integrated cleaning system, which can detect dust inside your camera and get rid of it. The Rebel XSi digital SLR camera accepts SD/SDHC memory cards. The high powered Canon EOS 7D digital SLR camera features a 18 mega-pixel CMOS censor with dual DIGIC 4 image processors. The 7D features a 3-inch LCD with live view function in both photo and video mode. Full HD video at 1920×1080 resolution is what you will find with the EOS 7d dSLR. The dual DIGIC 4 image processors give this camera speed and accuracy both when shooting video and shooting high quality pictures. The 7d features a magnesium body design that repels dust and is weatherproof. The Canon EOS 5D digital SLR comes with a 15.1 mega-pixel CMOS sensor with advanced noise reduction technology. It also has a 3-inch LCD with live view function that features face detection technology. This Canon camera uses a DIGIC4 image processor which improves the speed and accuracy for you when shooting. This camera does feature HDMI output for viewing you images on your HD television. The 5D features SD/SDHC memory compatibility. The T1i features a 15.1 mega-pixel CMOS sensor that can produce very large prints and high quality portrait prints. This Canon slr digital camera features the DIGIC 4 image processor. You also get a 3-inch LCD with live view capabilities. The T1i is capable of recording Full HD video 1920×1080 resolution, the Canon T1i features HDMI output for your HD television. This digital SLR camera accepts SD/SDHC memory cards.